The jaguar is the largest cat in the Americas, growing more than six feet long and weighing up to 300 pounds. Often confused with leopards, jaguars can be distinguished by their larger heads and powerful jaws, sturdier bodies, shorter legs, and characteristic dark rosettes on their coats. A small percentage of jaguars are all-black (melanistic); these are commonly referred to as black panthers. Jaguars once ranged from the Southwestern USA all the way to the tip of South America. They now occupy less than half of their historic range, and are found mainly in the rainforests of the Amazon basin and in the Pantanal wetlands. Excitingly, some lone individuals – such as the famous ‘El Jefe’ – are again living in the Southwestern USA, a region they were largely extirpated from in the 20th century. 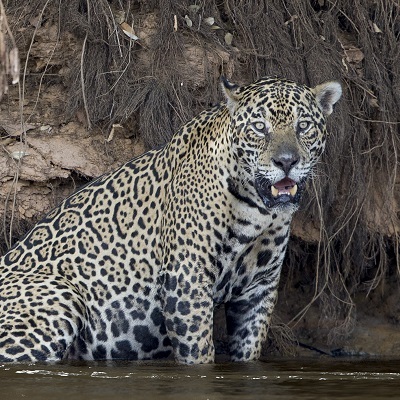 Jaguars are expert swimmers and have a much stronger affinity for water than other big cats; they can even successfully stalk and kill caiman. As apex predators, jaguars play a vitally important role in the ecosystem. They are solitary and opportunistic hunters, known to kill and eat a wide range of animals, including armadillos, cows, monkeys, fish, mice, and even sometimes anacondas. Unlike most big cats, which kill by a bite to the throat, jaguars kill by delivering a powerful bite to the skull. The lifespan of a jaguar is about 12-15 years in the wild, making them one of the longest-lived big cats. A female jaguar will typically give birth to 2-4 cubs at a time, and she will take care of them on her own; the presence of males is not tolerated due to the risk of infanticide. Cubs will stay with their mothers for up to two years before leaving to establish territories of their own. One of the main threats to jaguars is habitat loss and fragmentation. The rapid destruction of their forest habitat is also leading to increased conflict between jaguars and humans; jaguars are considered pests in some regions, and may be shot on sight due to fear or concern for livestock. Some ranchers even hire full-time jaguar hunters due to the big cat’s reputation for eating livestock. Other threats to this big cat include a depleting prey base and competition with humans for wild prey, persecution and retaliatory killings for attacking livestock, and the illegal trade in jaguar furs, paws, bones, and teeth. Born Free works to protect jaguars in the wild by supporting Jaguars in the Fringe, a project that works to protect the vanishing jaguars of Argentina, in partnership with WildCRU, Argentina’s Administración de Parques Nacionales (National Parks Administration), and Fondation Segré. This project works to protect the declining jaguars in Argentina by reducing habitat loss, degradation, and fragmentation, enabling prey base recovery, and reducing retaliatory killings.